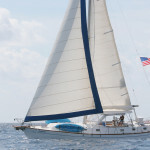 Caribbean sailing vacations are, according to many experienced sailors, one of the best choices for a sailing holiday. With all the different destinations and services, however, it can be difficult to make an informed decision in advance. Cruises can be a great choice for a luxury vacation. Weeklong cruises or one-day journeys with on-board dining rooms, sundecks, pools and entertainment areas are widely popular in the Caribbean, and you can find an affordable sailboat tour operator almost on any of the islands. Chartering a sailboat will offer you all the benefits of owning your own boat without having to deal with the different sailing and maintenance tasks. Similar to cruising services, most of the best chartering companies can be found on many of the major Caribbean islands. Calm seas, exotic destinations and gentle winds make the Caribbean Sea a perfect place for attending sailing school. Courses generally last about one week and cover theory, navigation and open water sailing. The Marina Cay anchorage in the British Virgin Islands, a small, peaceful environment covered in flowers; Peter Island with its fine beaches – especially Dead Man Bay – and the Great Harbor on Jost van Dyke, the perfect place for spending a night ashore, are some of the most popular locations for sailing vacations on the BVI. The Iles de Saintes, a small archipelago in the Caribbean, is another great place for sailing trips, its main three islands being Guadeloupe, Terre d’en Bas and Terre d’en Haut. The bay is well-protected and presents a few pleasant anchorages such as Firemen’s Bay (Baie des Pompieres) and Sugarloaf (Pain du Sucre). Other beautiful and quite well-known destinations for Caribbean sailing vacations also include Petit St Vincent and Bequia in the Grenadines, as well as Tortola and the Island of Virgin Gorda in the BVI.